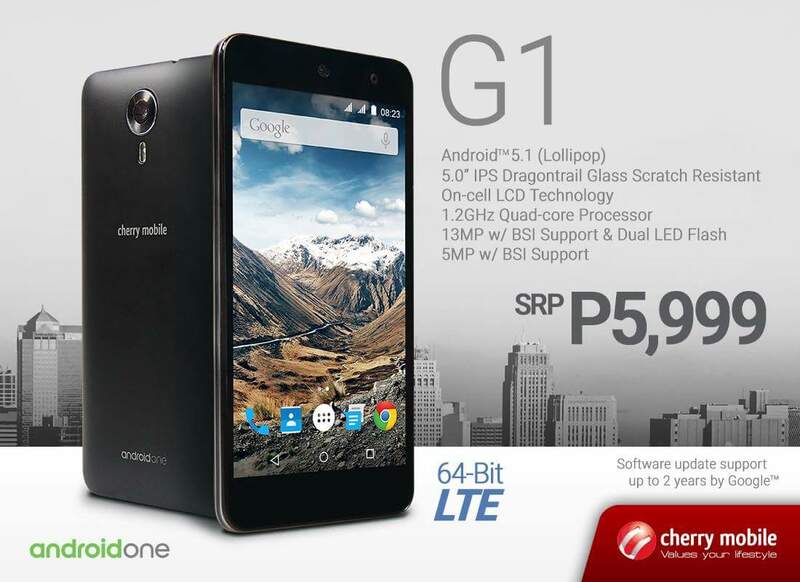 Cherry Mobile G1 becomes the latest breed of Android One smartphone focused in the Philippine market. It comes with LTE connectivity, 2GB RAM, 5-inch HD display and MORE! How much? Php 5,999! Cherry Mobile G1 is now officially the new breed of Android One smartphone released in the Philippines. The handset comes with a Google-approved hardware that will be driven with the latest version of Android mobile operating system. Likewise, being in the Android One program, the search-company is promising another two years software support if you buy this device. The Cherry Mobile G1 is marketed to be the first locally-branded handset to come with 64-bit desktop class architecture. In fact, it has been featured in the Cherry Mobile Facebook page giving us a good impression on how its specifications would be like. For the specs-initiated, the Cherry Mobile G1 comes with a Dragontrail-treated 5-inch IPS HD display with 1280 x 720 pixels. It will harness the computing power of Qualcomm's Snapdragon 410, the most widely-used chipset in the entry-level LTE market. The SoC features 1.2GHz quad-core Cortex A53 CPU coupled with an Adreno 306 graphics worker. It also boasts 2GB of RAM for faster app launching and multitasking activities. And yes, you've heard it right, Cherry Mobile fans will be left on the edge of their seats knowing that the device features a blazing-fast 4G LTE connectivity which churns with Cat 4 speeds (up to 150 mbps). Mobile photography enthusiasts will also be at awe with the improved crop of camera sensors. The Cherry Mobile G1 packs a zippy 13-megapixel rear camera that is reinforced with a 5-megapixel front sensor for your social media selfies. There's also the generous 16GB of native memory for file storage; and 2500 mAh of battery to give your device a long mileage. The Cherry Mobile G1 will, of course, boot with Android Lollipop on the get-go. What's more worth-noting is the fact that this puppy only has a Php 5,999 asking price making it one of the best deals for a handset to date. The G1 is expected to hit the shelves after its official announcement today.